Before a workout, that is. Research done over recent years has been hard on some traditional sports practices, with some approaches that have been ingrained in sports for many years now coming under close scrutiny. One such approach is the use of a 'warm up' prior to sport. As therapists and trainers, we hear many gym-goers, runners, and sports players guiltily confess, “I never warm up!” but the question is, do they need to and why? Warming up prior to physical performance is believed to facilitate mental and physical readiness, prevent injuries, and improve performance. Static stretching – once strictly adhered to has since been thought to impair performance and have no impact on injury prevention. As such, static stretching has been replaced with dynamic stretching. But is it wise to cease static stretching altogether? The body of research behind stretching is contradictory and often confusing. Let us first explore the different types of stretching before we talk about how and when to stretch. WHAT ARE THE DIFFERENT TYPES OF STRETCHING? WHY DO WE STRETCH AS PART OF A WARM-UP? Despite the high number of studies done on this subject, it is still difficult to say whether stretching helps performance. Some evidence shows that static stretching can briefly inhibit a muscle’s ability to generate power – this generally occurs when the stretch is held for longer than 60 seconds immediately before performance. However, in studies where stretches were held for less than 20 seconds 10 minutes before performance, it has been found that static stretching had no impact on performance. Some studies show that dynamic stretching can slightly improve performance when done immediately prior to the exercise. The negative effects of stretching before sport such as reduced power and speed shown in some research realistically will not be noticed by most of us and is only of importance to elite athletes at the top of their game. It also very much depends on what the sport is. 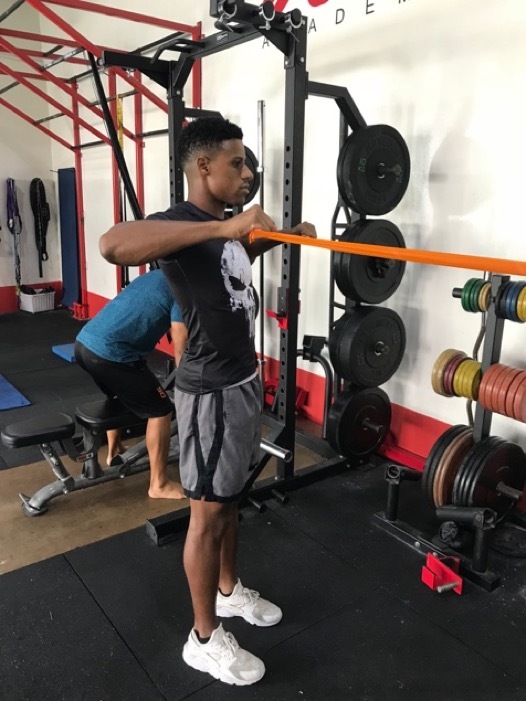 For something like gymnastics or martial arts, the importance of stretching beforehand is perhaps more significant than for sprinters or weightlifters where speed and power is key. It has been established that PNF, static and dynamic stretching can improve range of motion over a short duration. Over time, stretching enhances flexibility not by actually lengthening the muscle but by increasing the brain and body’s tolerance to that stretch by calming down the nervous system. It is proposed that by using a few stretches, whether static or dynamic, as part of a warm-up may cause short-term neural adaptations thereby resulting in an improved stretch tolerance. Again, the usefulness of this outcome depends on what you are about to do – is it an activity that requires deep, end range positions and full range of movement? It is often thought that stretching prior to exercise can reduce the likelihood of getting injured however the evidence for this is pretty weak and inconclusive. Some evidence suggests that static stretching has no overall effect on complex or overuse injuries but there may be a benefit in reducing acute muscle injuries, especially with repetitive contractions such as with sprinting. DOMS is muscle soreness that occurs between 24 and 48 hours after exercise and it usually occurs when someone is new to a particular exercise or has not performed it at a certain intensity previously. The effect of DOMS is often worse when the exercise involves eccentric muscle contraction (when a muscle contracts while lengthening or during the lowering phase of an exercise). While there is certainly no harm in stretching before or after exercise in relation to DOMS, it appears that there is little benefit to it with most studies showing very little or no difference in DOMs when stretching or not stretching. Any benefits may be most relevant for athletes who participate in high intensity exercise daily, and therefore need to recover quickly. The evidence does not seem too strong in favour of stretching as part of a warm-up. What should we do instead to prepare for exercise? Generally prior to going in to the ‘main body’ of your training session or sport the goal is to prepare the body by raising body temperature, heart rate, respiration rate and blood flow. This could be achieved through spending a few minutes on an exercise bike, doing a few ‘laps around the field’ or it could be achieved through sports-specific dynamic range of motion exercises that are relevant to the sport. Static stretching is likely to cool the body down and while being generally specific to a muscle it is not often specific to the requirements of your sport. So if you can achieve the flexibility requirements for your sport through dynamic stretching, why not trade in static stretches for higher intensity drills that are specific to your sport. For those who do use stretches regularly before a sport or activity, there may be positive psychological benefits of a familiar routine and positive expectations in which case it will not be harmful to continue. With no ‘one size fits all’ approach to warming up prior to exercise and some fairly wishy-washy evidence behind it, the most sensible thing to do is whatever feels right for your body in order to prepare it for whatever it is about to do. We cannot generalise that either static or dynamic stretches are more effective prior to performance, but instead must analyse the requirements of the specific sport as well as the individual. Including mobility work into a warm-up is a sensible idea, moving the body in ways that will help it in the exercise you are about to do. For example, if you are about to work on your squats in the gym, use a dynamic hip opener to get the hip joints moving before adding load. If you are about to run then doing some dynamic leg swings will help the legs prepare for the motion of hip flexion and extension. It’s about waking up the nervous system too, as well as the joints and soft tissues. Neuromuscular activation exercises are useful to help recruit those important muscles that you’ll be using in your session. For example, runners are often advised to do some crab walks, gluteal bridges or some single leg stability work to get their gluteal muscles firing; this will then help with their running technique and efficiency. Get blood pumping, increase HR, blow flow and respiratory rate. Encourages physical and mental readiness. Move joints and soft tissues to prepare for the movement/training you are about to do. Calm down nervous system to cope with ‘end range’ or deeper positions if needed. Wake up muscles needed to enhance technique and improve performance in the sport. Full physical and mental readiness, high intensity for optimal preparation. As such, follow the recommendations, apply them to your sport but most importantly, listen to your body do what feels right for you! Lucy Warren is a Physiotherapist and Pilates specialist from the UK. She has a first-class honours degree in Physiotherapy from Cardiff University, and is also an APPI-trained matwork instructor. Lucy has extensive sports experience with professional and semi-professional teams and athletes, having provided pitch-side physiotherapy for multiple elite sport teams in the UK. She has also worked for the British Army for two years, assessing and treating infantry soldiers and helping them to rehabilitate to peak fitness. Lucy taught matwork Pilates for several years before making the transition across to Reformer Pilates. Lucy loves using the Reformer and other Pilates equipment with her clients in order to achieve their specific rehabilitation goals. She believes that it is an incredibly versatile tool which can lead to daily life improvements like better posture and more efficient movement, as well as relief from pain associated with physical imbalances. In her own time Lucy is a keen netballer, skier, and loves to travel to new places. Whether you’re in the saddle to commute, training to compete, or just for fun, cycling is an excellent exercise as well as a fantastic way to get around. Being an Osteopath as well as an amateur cyclist myself, I know that cycling injuries do occur and often re-occur. In my experience, injuries are usually caused by overuse or poor riding form. 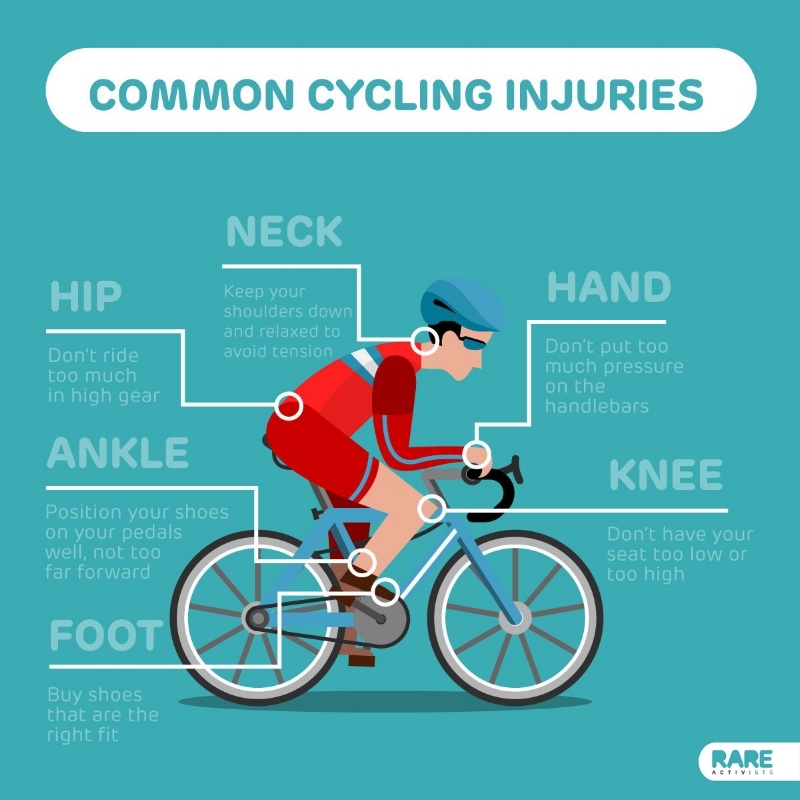 The resulting pain and physical limitations can be particularly debilitating for cyclists, impeding performance or preventing you from continue to cycle altogether. Luckily, most injuries can be resolved fairly quickly with some simple bike set-up tweaks, and some manual therapy such as Osteopathy for persistent pain. This is largely caused by the sustained flexed forward position in cycling which can put excessive pressure through the joints and discs of your low back. Raise your handlebars to reduce the amount of flexion going through your lower back. Daily stretches and exercises to improve hip and lumbar flexibility - an Osteopath or other manual therapist can advise on the best stretches for you. Neck pain and headaches can also be due to a flexed forward cycling posture. This in turn causes your neck to over-extend, especially when you are looking up and around. Long periods of neck extension can lead to muscle tightness, joint pain, and associated headaches. Raise your handlebars to decrease the extension curve in your neck. Alter your cycling position so you are sitting in a more upright position for short periods. Do regular neck flexion and side-bending stretches to ease neck and shoulder tension – consult an Osteopath or other manual therapist on the best stretches for you. Knee pain is commonly caused by your saddle being too low, or your cleats not in an optimal position. A saddle that is too low means that your knee and leg never straighten out fully. This leads to shortened hamstrings, sustained tension on the knee cap, and weakening of the muscle controlling the last 10 degrees of knee extension (known as the vastus medialis). All of these can lead to knee problems such as patella mal-tracking, patellar tendonitis, and overuse injuries. Many road cyclists use cleats to connect their shoes to the pedals. Whilst cleats improve performance, they can also result in persistent knee pain if they are not optimally positioned. Cycle in a lower gear to decrease the amount of stress through your knee on each pedal stroke. Consider getting a professional bike-fit done. An optimally placed cleat position can help to prevent many cycling related pain. Leaning forwards during cycling puts a lot of tension through forearms and hands, which can be exacerbated by gripping the handlebars too tightly and not varying your hands position. This can lead to repetitive strain injury (RSI) with pain and tightness in the wrists, forearms and elbows. Some cyclists also experience tingling and numbness into their hands and fingers, most commonly on the pinkie and ring fingers. This is caused by compression of the ulnar or median nerves due to the sustained wrist and hand position on the handlebars. It can be made worse from the bike vibration if you are cycling on rough terrain. Change your hand position on the handlebars regularly. Ensure that your wrists are straight and not over-extended. 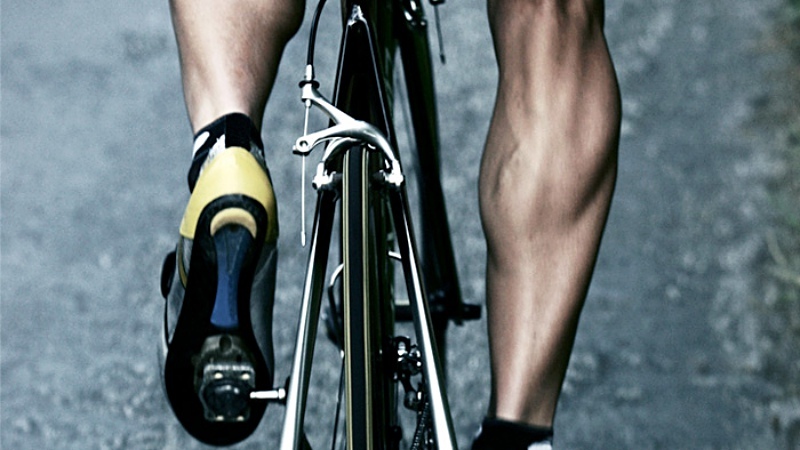 Hamstrings and calves are the most common muscle injuries amongst cyclists. This is because these muscle groups get particularly tight, making them more vulnerable to tears and tendon injuries. Warm up before a ride, and stretch afterwards to keep your muscles healthy and flexible. Using a foam roller after a ride for myofascial release can help with this too. Check saddle height. A saddle that is too high can put a strain on the hamstring tendons. Check cleat position as cleats too far forward may put a strain through the achilles tendon. Pace your training program. Build up gradually to longer-distance cycling. WHEN SHOULD YOU SEEK PROFESSIONAL HELP? If you are experiencing the pain only when you are riding, then hopefully the above tips can help alleviate the issues. However, if the pain persists even when you are off the bike, you may need to get professional help. An Osteopath will be able to provide relief by releasing restrictions, improving flexibility, and releasing muscle tensions. Osteopathy can also give you the best chance of staying pain-free by maintaining joint health, mobility, and muscle flexibility, as well as provide you with an individualised exercise advice. You may also want to consider getting a professional bike fitting done. This will ensure that no particular part of your body is under excessive strain, which should also help to improve performance. Sebastien Bodet is a qualified Osteopath from France with a MSc in Osteopathy from Ecole d’Osteopathie Paris. He is also a certified Personal Trainer and Swimming Coach. Sebastien is a former Olympic swimmer who represented France in the 2008 Beijing Olympic Games. He was a member of the University of Michigan Elite swimming team, and to this day remains an Olympic Sports Ambassador in France. Sebastien's area of specialty is sports injuries, rehabilitation, and pain management. As a former professional athlete, he understands what it takes to maintain and rehabilitate the body for a high level of sporting performance. He takes a holistic approach to injury treatment, not limiting the treatment plan to only the pain area, but accounting for the entire body structure and lifestyle habits to create a fully customised treatment plan. Sebastien's priority with every patient is to ensure safety and efficacy of their treatment plan. He is passionate about restoring body fitness and function to its optimum so that all of his patients can live life to the fullest potential. The rise in mainstream popularity of combat sports in recent years has seen more people taking up the sport as a way to keep fit. Be it boxing, muay thai, jiu-jitsu, or mixed martial arts (MMA), combat sports are great for stress-relieving, as well as offer a cardio-intensive full-body workout. While this development is exciting and highly promising, there is a growing concern over the increase in numbers of combat sport-related injuries we see in the clinic, particularly in the shoulders. This can greatly impact on your training and performance in the sport, and if not treated in time, develop into a more serious chronic condition. The gleno-humeral joint of the shoulder is a ball-and-socket joint, in which the spherical humeral head (ball) is ideally centered in the glenoid cavity of the scapula (socket). 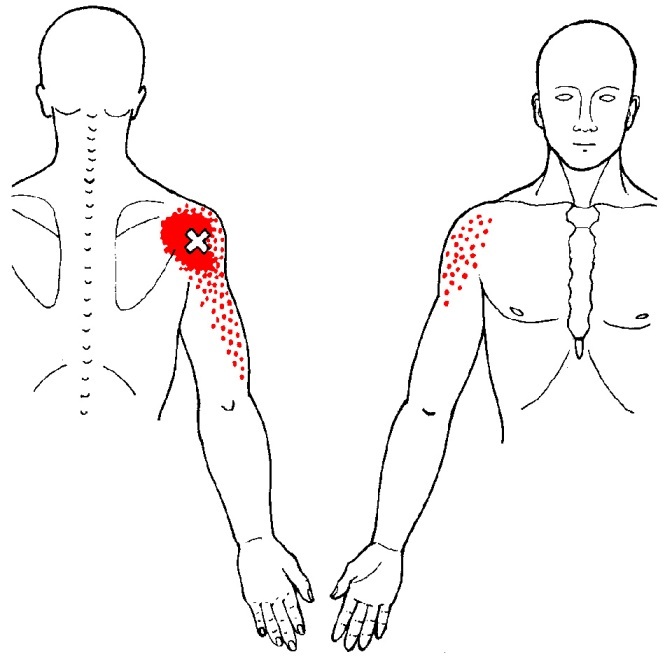 Feeling “loose” in your shoulder, as though the shoulder is going to pop out of place with certain movements. We’ve seen our fair share of shoulder dislocations while fighters are trading punches, or getting caught in a clinch. A dislocated shoulder can put you out of training and fighting for months. 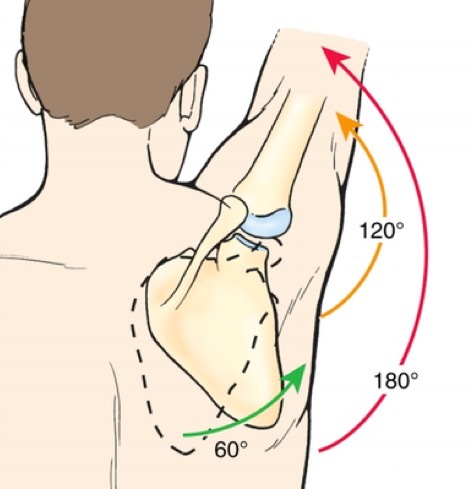 Left untreated, shoulder instability may result in recurrent misalignments and dislocations, causing fighters to lose precious training time and confidence in their punching, clinching, or grappling abilities. The rotator cuff is a group of muscles in the shoulder that primarily moves the shoulder into internal and external rotation, and also functions to improve the stability of the shoulder joint. In the absence of acute trauma, rotator cuff dysfunction in combat sport athletes often begin as relative weakness of the external rotators in comparison to the internal rotators, which are often in a shortened resting position as a result of a typically-hunched fight stance. Over time, the external rotators become strained in an elongated position, as they counter the force of the internal rotators. With repetitive straining over time, the tendons of the rotator cuff undergo degeneration with wear and overuse. Overtime, rotator cuff weakness and inflammation may eventually lead to a tear. Rotator cuff tears are often painful and debilitating, leaving fighters unable to train and compete for several months. Rotator cuff tears have been known to heal poorly. The majority of rotator cuff tears often go on to become larger tears or full-thickness tears if untreated over time. Hence, it is important to seek treatment early to maximize healing and minimize further injury. The scapula is an important consideration in the shoulder joint. Since the glenoid cavity (as mentioned above, it’s where the ball-shaped end of the humerus) is part of the scapula, its position in motion is crucial in housing the humeral head to maintain smooth and efficient movement of the shoulder. Scapular dyskinesia is a collective term referring to dysfunctional motions of the scapula during shoulder movement. It often presents with increased bony prominence of the scapula. While scapular dyskinesia itself is rarely the source of pain, it may be present in shoulder injuries or any muscular imbalance in the shoulders, making it worth an assessment for any contributions to structural and functional errors in the shoulder. 1. Holding a dumbbell in one hand, rest you elbow on your knee, with your arm pointed downwards. 2. Lift the dumbbell by turning your arm upwards. 1. Hold a resistance band around your hands. 2. Stretch the resistance band by bringing your hands in-line with your shoulders. 3. Raise both arms in front of you while keeping the the resistance band stretched. 1. Pull a resistance band towards your chest with your elbows bent at the side. 2. Turn your forearms upward. The above exercises serve as a general guideline to athletes looking for warm-up ideas for a healthy shoulder. Should you experience shoulder instability or pain during your martial arts training, or have been diagnosed with a rotator cuff injury, you might want to consider visiting a Physiotherapist. 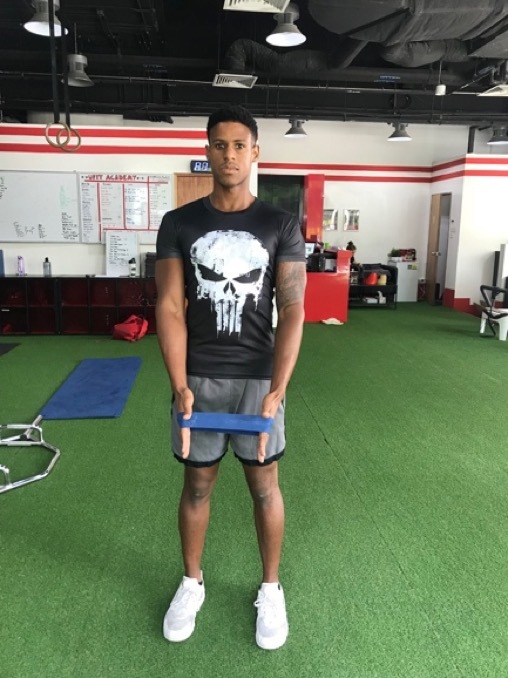 Your rehabilitation plan may often consist of a program that progressively loads the shoulder, with an emphasis on motor control and dynamic stability through movement. The aim is to get you back to training with greater confidence and reduced injury risk. Do you participant in combat sports training regularly? We can help you in your training performance and recovery! Daniel Arthur and Nada Khalid are Physiotherapists at the UFIT Clinic. Between them, they share a great passion and plenty of experience in combat sports training, which provide them with the understanding of prevention and treatment methods for combat sport-related injuries. Daniel holds black belts in Taekwondo and American freestyle kickboxing. He is a Bronze medalist at the ICO World Championships in Italy, where he represented England. He is also an experienced kickboxing trainer, having taught the sport since he was 16. As an active muay thai fighter, Nada trains up to 6 days a week. She has won multiple national-level Muay Thai fights, and most recently fought and won her professional debut in Thailand by a technical knockout. Meet Mok Ying Rong, our new physiotherapist at the UFIT one-north Clinic. A competitive runner and Nike Sponsored elite athlete, Ying is Singapore’s Half-Marathon record holder, and well placed to help clients recover from sporting-relating issues! She’s joined up with #ROCKrunners in the lead-up to the Singapore Standard Chartered Marathon, where she’ll be giving talks on one of her passions – running pre-habilitation! I’ve always been too active! I started competitive swimming in primary school and represented my swimming club and school at national and club levels. I moved on to triathlons in high school before running seriously at 16 and representing my school, Raffles Girls Secondary, at national meets. I was getting on the podium at these and decided to try national level events. At first, it was intimidating running with the giants but as I ramped up my training and became more systematic, found myself winning more and more races. I’ve always been self-coached, I feel very tuned-in with my body, and pretty soon, found myself knowing what works and what doesn’t. My first race representing Singapore was the Asian Cross Country in Bahrain when I was 16. Signing a contract with Nike when I was in high school and representing Singapore in the 2016 World Cross Country Championships. The partnership with Nike really boosted my confidence in my training and racing, and I’ve been representing them for almost 7 years and am simply thankful for their unwavering support. My most significant career highlight is definitely winning the 2016 Gyeongju Cherry Blossom Half Marathon, breaking the Singapore Half Marathon record by 2 seconds! My time was 1:23:14 and I vividly remember it to be one of the most painful and intense race I have ever done. How do you train for your races? I select the main races I’ll do at the start of the year and then periodise my training phases. Some overseas races pop up and I take them in my stride. I’ve always believed in the journey, rather than an end-goal as running is my passion, and always make sure I do my conditioning and prehab work so I can progress my running fitness safely. What got you into physiotherapy? I was getting my fair share of injuries, my most tragic moment being having 5 stress fractures at one time over my left foot. I also had multiple shoulder issues from swimming. I started to do my own research to understand why I was getting injured which sparked my interest in physio and I knew this was the career for me. As a physiotherapy student, I did workshops with companies and small interest groups, spreading my passion for pre-habilitation (prevention instead of rehabilitation) for runners. I initiated a project called ‘RunFree’ when I was in my 3rd year, which believed that running should be free for all, made possible if people can run free from injuries. I’ve run sessions for anyone wanting to progress their running safely, including a movement screen based on research and running biomechanics, followed by guidance with these runners on a safe running program. What’s in your head before a race? Come and meet her at the UFIT one-north Clinic or within the UFIT running community very soon. Foot pain: To treat or not to treat? When we exercise frequently it's inevitable we'll get aches IN OUR ANKLES AND FEET FROM TIME TO TIME. In the case of UFIT Clinic client Evy Theunis, a trip to senior physio Declan Halpin was definitely worthwhile after she experienced an extended period of foot pain. "At the end of my pregnancy, my left achilles started to hurt. I didn’t think much of it, and assumed it would just disappear after delivery. Little Alexander came, but the pain in my left foot stayed! Short walks would still really hurt, so I decided to go see a doctor who referred me to a physio – and there came UFIT Clinic's Declan Halpin! Apparently I had developed Achilles Tendinitis, and was in for a couple of months of recovery. No running, no tennis, no cycling outside, no lunges, no step ups, NO HEELS, no nothing, HELP!!!! My plan to get back in shape before I would go back to work went out the window - or so I thought. Let alone do the Spartan race I had planned for in November. But thanks to my weekly appointments where Declan stretched and massaged my Achilles (we did accupuncture as well), and thanks to the new exercises he gave me to strengthen my heel muscles, we quickly started seeing progress. (An important point to note: when your physio gives you exercises, do them - sounds logical right - but most people apparently don’t. And it makes a huge difference). All in all, it took us about 6 months to get me completely back to normal, AND, with the help of Declan’s magic hands, I made it to Bintan and finished my first Spartan!". The award-winning UFIT Clinic is Singapore’s leading exercise rehab, injury recovery and women's health clinic. It's holistic approach and full range of physiotherapy and massage-related services by its experienced and friendly specialists can help you prevent injuries before they happen, or get you back on track as soon as possible once you're injured. OK, so we are mostly aware of the obvious reasons to get a massage; relaxation, stress relief, easing muscle soreness, injury prevention and management. All of these are fantastic and very well documented ways in which massage therapy could and should be a part of our lives on a regular basis. Whether you’re engaged in five UFIT bootcamps a week and not stretching out properly (naughty naughty), or whether you're stuck under a laptop all week and suffering from carpal tunnel syndrome, your muscles are getting used and abused on a daily basis. Building regular massages into your routine can help soften, open up, stretch, release and allow extra, oxygenated blood to flow into those muscles and joints enabling you to reach and push further than before. Racket sports, driving, carrying kids on one side, generally just not being ambidextrous (who actually is? ), all have an effect on the shortening of our muscles, and therefore tightening on one side. In a sporting environment, achieving good balance is key, and with a good massage to realign the posture, you could be well on your way to equilibrium. Exercise can be a migraine trigger (which presents a bit of a conundrum). Massage can help relieve muscle spasms, improve circulation, enhance sleep quality and increase serotonin, all of which can play a part in preventing not just tension headaches, but vascular headaches. Any migraine sufferer knows an attack can happen any time, so begin by pre-empting the threat and having a massage once a week to keep them at bay. Having just one massage can boost your immunity. How? Massage interacts with the hormone system and decreases levels of cortisol, the stress hormone in the body. When you’re stressed, you probably notice you get more colds, sleep less well, just don’t feel 100%. Massage manages that cortisol away, and encourages the production of white blood cells, which defend your body against illness. So no more excuses not to get out for that run! Massage releases dopamine and serotonin, eases physical pain, calms the mind, decreases anxiety, soothes tense muscles and the sheer act of touch can simply be enough to lift your spirits. So use massage therapy alongside regular exercise, to help stabilise moods and tackle those challenges whether they be physical, emotional or mental. 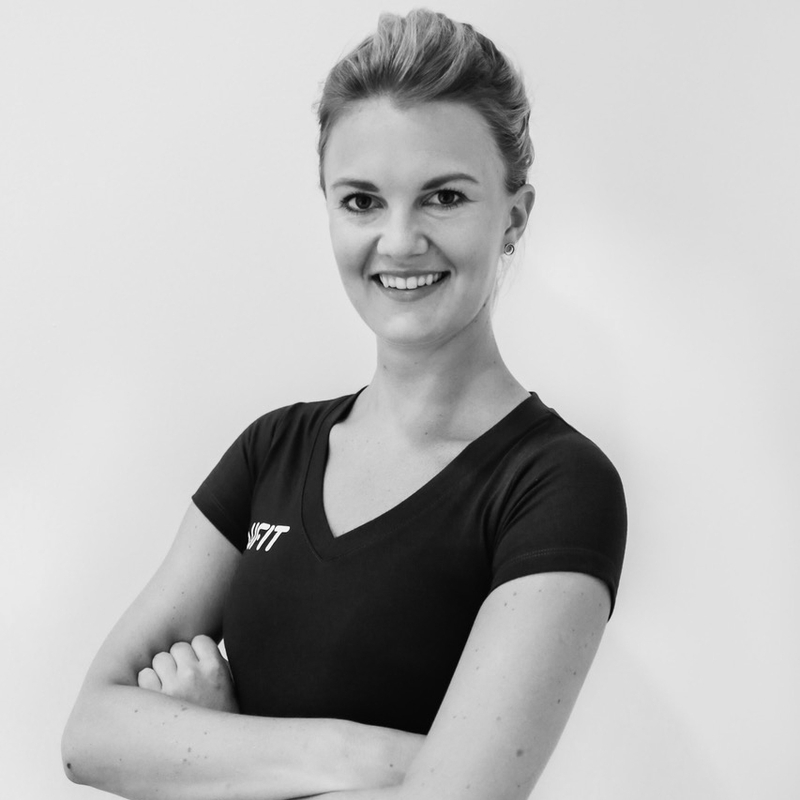 Lynsey is a UK trained massage therapist and certified in both ITEC and BTEC level 4 Massage and Anatomy and Physiology. Having spent 15 years working in high-pressure marketing roles, Lynsey decided to embrace her ultimate passion in bodywork and use her experience to help people overcome the physical and mental stresses that modern life puts upon us. She is a passionate believer that massage and sports massage should be a part of our everyday lives to support our bodies in whatever challenge we put upon them; whether you are a professional sports person, have a sore back from carrying your baby, or simply need to release some tension from a day in the office. Muscular pain, poor mobility, bad posture - there are many ways to treat these issues. Here is how Rolfing has helped hundreds of UFIT clients move freely and comfortably again. Rolfing is a hands-on therapy that takes a holistic, full body approach to let you move more easily and comfortably. Through manipulation of connective tissue, Rolfers improve postural alignment and structure over the long-term. Unlike massage, which often focuses on relaxation and relief of muscle discomfort, Rolfing focuses on improving body alignment and functioning. Also known as structural integration, Rolfing has been used by many professional athletes to rehabilitate injuries, break up scar tissue, and increase range of motion to improve performance and avoid future injuries. Dancers and musicians often use it to increase comfort in their bodies while performing, as well as avoid repetitive stress injuries. In the UFIT Clinic, Rolfing has helped clients needing postural corrections after weight loss or pregnancy, office workers with repetitive strain from sitting too long, and others with injuries or tightness from their training. When you first visit Maria Hussain, UFIT's Rolfing specialist, she will get you to stand while she checks your posture and how your joints are positioned. While you may go to see her with a knee issue, she will quickly seek any imbalances in other parts of the body which may cause the knee pain - such as a lack of ankle mobility - and treat that first. Says Maria "Walking is the most functional exercise of the body yet often we don't walk correctly which can cause postural issues, joint immobility and pain as we place pressure on other parts of the body". Rolfing embraces a wide range of approaches including osteopathy, chiropractic medicine, yoga and the Alexander Technique. It manipulates the body’s Myofascial system - the connective tissue (fascia) - which is the biological fabric that holds us together and enables stability of muscles and bones while allowing movement, and is crucial in high performance and central in recovery from injury. Says Maria: "My objective is to lengthen, stretch and soften affected tissue to improve posture and bring the body’s natural structure into proper balance, alignment and integration". Injury, stress, exercise, and work related repetitive movements can cause fascia to lose its elasticity and become shorter, tighter and denser. Tightened fascia pulls our muscles and skeleton out of proper alignment which can cause pain, discomfort and fatigue. By fascial manipulation remarkable changes in posture and structure can be achieved. "At my first appointment I was hunched over and my entire body was in a state of shock. I wasn't aware of how I was carrying myself. Maria’s knowledge of the effect of a road traffic accident on the body has been key to my recovery. She explained what was going on with the myofascial tissue, which helped me gain confidence to start moving normally again. I'm exercising again and Maria continues to assist me by identifying movements I need to get my normal gait back and minimise pain. Aside from that, Maria is such a helpful person and has been a great support on getting me the best results in recovery". An aligned and balanced body can ease strain patterns in the entire system and improve breathing and increase energy, boost self-confidence and relieve physical and mental stress. Rolfing has also been shown to reduce spinal curvature in people with lordosis (sway back), and enhance neurological functioning. Rolfing is beneficial for everyone - for pain management, to enhance athletic performance, to facilitate injury rehabilitation and anyone who just wants to move better and feel more co-ordinated and aligned in their body. Maria is based at the UFIT Clinic, at both 6 Raffles Quay and one-north. An ACL rupture is one of the most dreaded injuries in sport – not only is it painful, the rehab process is long and difficult, and tests the determination of even the most committed patient. Thanks to advances in rehabilitation and improvements in surgical techniques, it's not the career-ending injury that sports people once feared. With proper guidance, patience, and a large dose of motivation, it is definitely possible to make a full and complete recovery. Marie De Place is a perfect example of someone who overcame such a major setback, and is now stronger and fitter than ever. She had her first appointment at the UFIT Clinic in March 2016, after a skiing accident. A year later she has just done her first Olympic distance triathlon. Here she shares with us her road to recovery with senior physio Declan Halpin, and the ups and downs along the way. “My first thought was ‘I'd better be skiing again soon as I just bought a nice brand new ski jacket yesterday’ (typical girl thinking I guess). My second thought was "Good news! I will not have to train for that stupid triathlon that my friends convinced me to join". My third thought was "Hey, I will finally experience going down a ski slope in a sleigh pushed by the rescue guys". 1. Acute Phase - Where the focus is on reducing the pain and swelling and improving range of movement. 2. 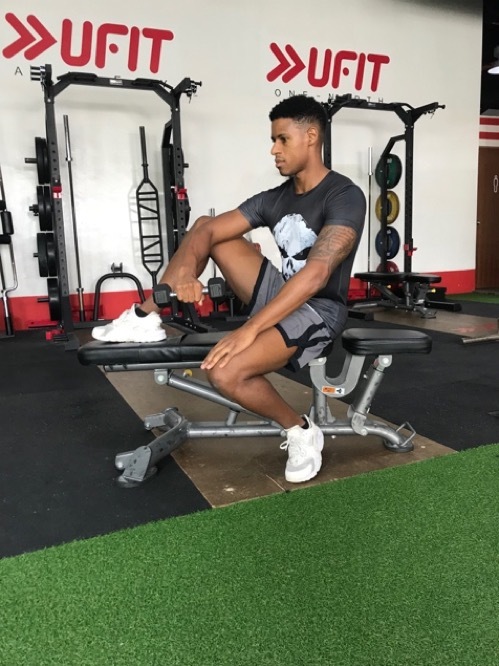 Activation Phase - Returning the knee to full range of movement, strengthening key muscles such as your hamstrings, developing knee stability with balance exercises, and introducing body weight exercises such as air squats, bear crawls and lunges. 3. Strengthening Phase - Building strength back into the leg to make sure both sides are equally strong. This usually means picking up some weights and doing lots of squats, deadlifts, step-ups, and other lower limb exercises. 4. Power Phase - Your leg can’t just be strong – it needs to be fast and powerful as well! In this phase we get you to hop, jump, skip, and run (in a straight line). This is often when the patient feels like they are really making good progress! 5. Return to Play - The final part of the rehab process is the most fun. Lots of side to side movements, agility runs, ladder work, and jumping around on wobbly surfaces! So how did Marie find the process? Creating a supportive atmosphere is key, but Marie believes it is more than this, it also requires trust. “I had a great experience at UFIT. Everyone, from the receptionist to the physio team is welcoming, positive and attentive to your needs. They are great professionals providing an efficient recovery plan, prescribing relevant exercises, executing targeted massage and treatment. Marie says there is nothing she would have changed in her rehab process, and has given the UFIT Clinic the best compliment that anyone can give – referring her friends and family to come and see the team. Thank you Marie – congratulations on your recovery and your Triathlon, and hopefully see you soon (but not too soon)! !